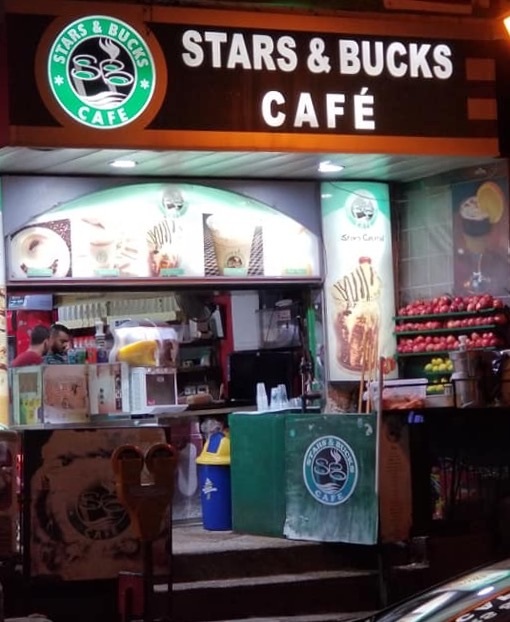 Stars & Bucks Cafe is better than Starbucks because there is no Starbucks in Bethlehem. Coffee Palestinian style. Free Wi-Fi. They also offer juice, ice cream, desserts and much more. Also, they sell their own “You Are Here …” mug. Good souvenir. Hard to miss the shop on the way to Church of Nativity. This entry was posted in Pilgrimage and tagged Bethlehem, Coffee, Palestine, Photography, Starbucks, Stars & Bucks, Travel by Perpetua. Bookmark the permalink. No kidding. This is where Starbucks got its name. I’d get my coffee from there only….if I were there. Alan, I like your sense of humor. Better yet, make your own coffee. Save some Bucks. If you are ever in Louisiana get some Community Coffee. It is better than Starbucks. Actually, I prefer community cafes.